Kids are odd little creatures. They like silly things like SpongeBob SquarePants. And Masha and the Bear, that Russian cartoon on Netflix. But then they also like kind of gross stuff. And we don't just mean slugs, frogs, and mud pies. No, we mean the violent kind of gross stuff. Your kid seems to have a pretty high tolerance for anything gory. Heck, you remember being his age, and not getting squeamish during the original My Bloody Valentine, and Clash of the Titans. Now, he likes to watch stuff like that. He likes to pretend he is a gladiator fighting in the arena. Or one of King Leonidas' brave Spartans. You wish he were into something a little safer than sword fighting. Like LEGOs. But you can't stop him from being interested in the Gladiators. In fact, letting him dress up in this Kid's Gladiator Costume might be just the thing to get it out of his system. Letting him fight his friends might help him move onto other interests. Either that, or he will become the best sword fighter on the block. Challenging all the kids to gladiatorial combat. Your back yard might become a miniature arena. 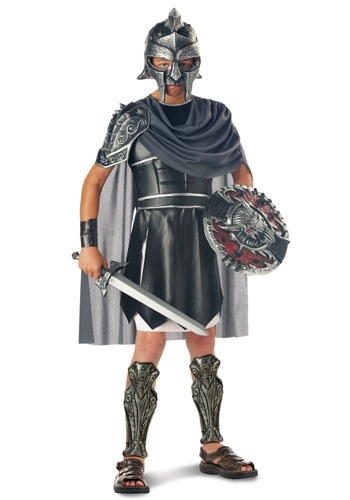 Don't forget to grab a Gladiator Sword and Shield when you order this costume. Every Gladiator worth his salt should have a good sword to win the crowd with. Then maybe he will go back to watching SpongeBob. My son needed to dress up like Ptolemy (tall-e-mee) the First for a greek reinactment for his 6th grade class. WOW! The size chart worked perfect so the size was just right however my son is on the thin side. The shipment was delivered as promised. The costume ready makes my son look the part! The mask did not have nose holes however it will be easy to the mask to make them just the right size for my son's nose. My son is very excited for his classmates to see him in his Greek General Costume. No air hole in the helmet - could have been 5 stars! My son loved this costume! The only reason I couldn't give it 5 stars was that the vinyl helmet DID NOT have any nose holes and it completly covered his nose - making it impossible to breathe through the nose. I had to take a razor & cut out holes. I didn't like doing that since I paid so much for it. I got this costume for my 12 year old son to wear to Disney's Mickey's not-so-scary Halloween Party. It fit him great he had a lot of room to move it wasn't too tight. He got a lot of compliments really great costume. My son is 5 foot and 168 pounds and he wears a 14/16 so this fit him great.